Malta was recently placed as the top European destination and the third best in the world for diving. The waters around Malta, Gozo and Comino provide some of the best dive sites in Europe. There are various different types of dive site (including wrecks, open water and cave dives) and the clear warm water as well as the array of marine life make diving in Malta an unforgettable experience. The sea temperature never falls below 15 degrees, visibility is excellent (up to 40 metres) and it is possible to dive all-year-round. Our scuba-diving courses are offered through one of Europe's leading dive bases that is a PADI 5* dive school and a BSAC Centre of Excellence in Malta. 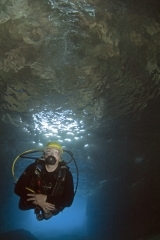 The dive instructors are all fully qualified and highly experienced. They place the utmost importance on safety and service.